Vallibel Finance PLC has become one of the fastest growing financial institutes in Sri Lanka under the vision of business tycoon Dhammika Perera. Formerly known as Rupee Finance, VFIN’s core business functions include FDs, Leasing, Hire Purchases, Micro Finance & personal loans. VFIN managed to show 55% growth in December quarter EPS of Rs. 2.54/- compared to the same quarter in 2013. Now it’s just a matter of time we witness annualized EPS hitting Rs.10/- plus. Looking at how they grew their network, the last 4 months show a promising progress - They have opened 3 branches in Rajagiriya, Anuradhapura and Kegalle and partnered with DIMO to promote TATA vehicles. With this deal, attractive leasing options for TATA Commercial and Passenger vehicles wil be offered by VFIN to its customers. At an NAV of 33.81, VFIN is trading at PBV x 1.49. The current share price around Rs. 50/- is a bargain price for the big shots to enter and collect. May be that’s the reason for one of the Director’s to be on the buying side for some time. Therefore, on a fair value basis, a financial entity should trade at least at PBV x 2.0. This makes VFIN one of the attarctive counters available for medium term. The valuation based on PBV sees Rs. 67/-. But its not a guarantee that VFIN reaches this amount in one go. On a tech note, VFIN currently engages in a channel where 53 sees a channel top and 47 sees a bottom. Above 47, it has support. 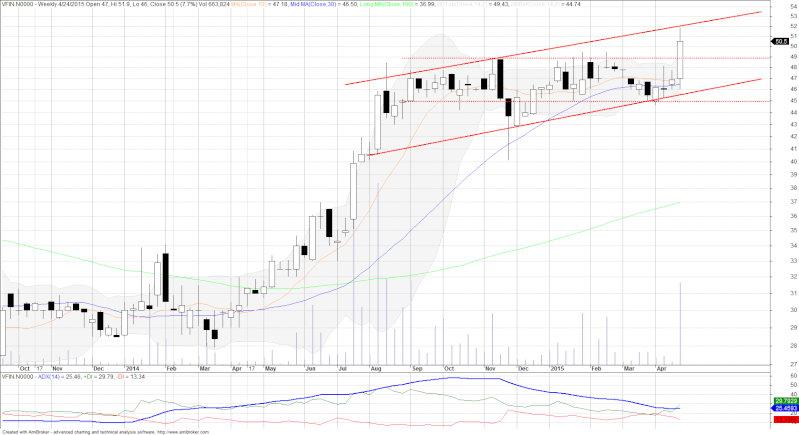 So of this can break 53 in near term, we can see this making new highs. If not a correction towads 44-47 can also be expected. Re: VFIN - where the journey leads it? SLS had been talking about the share when it was in the 30s or before btw. Financial institutes don't necessarily have to trade at 2x book value. It depends on many factors including projected ROE, NPL etc.,. In the past acquisitions were made around 1.5x-2.0x for even weak companies. COCR is trading above 3x due to its high growth and ROE. 2x is a reasonable for me personally. IF VFIN posts 10/- for this year, even with 1.5x we can expect it to trade at (33.8+10-2)*1.5 = 63/- (I assumed a 2/- dividend) by end of this year. 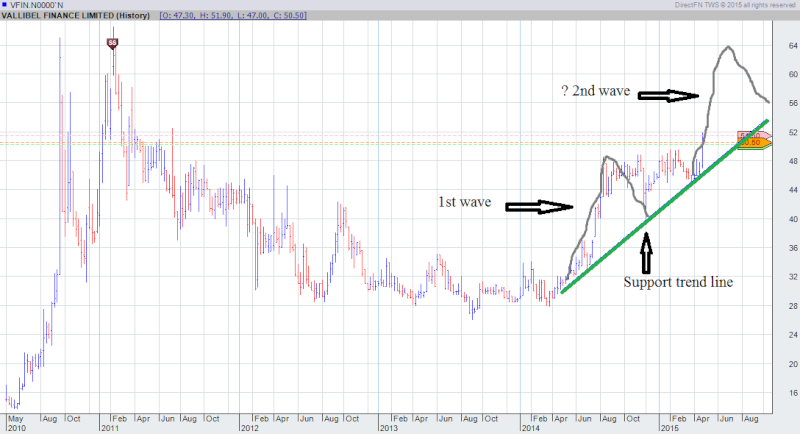 That's a 37% gain from the 46/- levels where collection was going on and 26% from current price. When we consider VFIN, it's worth to talk about LFIN too. Similar multiples. Big brother SAMP is another to look at too. Agrred a share with slow and steady progress. Yes this is something I wanted to collect but couldnt do that much for the price I wanted. There was a clear collector for it. As mentioned here whenever the price dipped he was there to grab it. 54 seems to be the immediate resistance,once broken 66 will be the next. Nice collection happened around 47 and a dividend is due. So it may go to 54 in next few days without much difficulty. Thanks Small, FG, Path and others. It seems some party has been collecting this and becoming hot. If they continue doing it, they may push to ~65 and let it drop ~55. Here is my view in a chart. HUNTER wrote: Thanks Small, FG, Path and others. The best period for VFIN is yet to come. The results of newly opened branches will have a positive impact on the financials and this may take a few quarters. LFIN declares 25% of profits as dividends and VFIN also would do the same but might take a few quarters due to expansion. If you patiently hold this then you are a winner. What a result by VFIN. Annual EPS for 31/03/2015 is Rs. 8.97. Agreed. Sadly that one bad quarter stopped them from achieving 10 EPS. Anyway, slow and steady wins the race. Likely to hit the three figure mark like most others anytime soon ? (Hold none in my Pf right now). Hopefully . It has only 41M shares and one of the lowest PE ratios in the sector. Personally, i see it as a growth stock for the future. Might take another quarter or two to hit the three figure mark unless there is a massive bull-run due to election/results. (I hold a considerable amount of the said stock). It will probably take a break here. Dividend was just as expected (realistically) so not much movement in price although there were small lots being sold. What would your choice be between PARQ and VFIN? Different industry, same price range and both seem strong. PARQ is good if it comes down ard 58-60 in month end sales..
VFIN is stagnant after a good report but 2 rupees divi. Month end credit clearance. People who bought on credit forced to sell. That's why VFIN and PARQ are slow. Both reported excellent results. VFIN will be able to report over 3/= EPS from next quarter. This is surely worth over 80/= and has the lowest PE in the sector along with LFIN. Nothing to worry. It will pick up very soon. Both would give good returns in the medium run. Two totally different models. VFIN can virtually dispense more loans in the coming quarters and earn hefty cash from wide interest margins. I expect rapid growth for the finance sector with more dispensible income, low interest rates, demnd for motor vehicles and consumer durables. PARQ is related to the construction segment of the economy. VFIN is linked to many segments of the economy bring in business. For me VFIN will hit a billion rupee's plus profits in next 18-24 months if things remain stable. If VFIN hits Rs. 1 billion mark then the EPS would be Rs. 25. I think this might take 3 to 4 years if the economy does well. You said it well Rapaport. (Enticing me to look at Finance companies hitherto shun with serious interest). Rapaport wrote: PARQ vs VFIN. Some people selling VFIN at very cheap prices. VFIN would report an EPS of over 12/= for the financial year 2015/16. Dividend pending and XD is on 5 June. VFIN would appreciate significantly if you hold it for a few quarters. They have opened many new branches recently and each quarter they will be able to show better performance.